38-year-old Shivanandan Tanti, from Lodhipur village in Bihar, India, appeared for most of his life to be an ordinary poor man. The only job he could find was weaving tussar silk on an old wooden loom, exactly the way his father and grandfather had done before him. He worked just a few days a month and lived in a rough hut with his wife and five children. They ate nothing more than Sattu, a powder-based food made of ground lentils and grains. Bihar, bisected by the Ganges River and shadowed by the Himalaya Mountains, used to be infamous for crime, corruption, and lack of infrastructure - yet also famous for the tussar silk weaving of Shivanandan’s heritage, so much so that the city of Bhagalpur bears the nickname “Silk City.” Bihar’s current chief minister strives to build education and economic empowerment (13-14% growth in GDP in the past two years). Yet poverty persists here, child malnutrition rates soar, and most educated youth flee to neighboring states for a better life. Shivanandan doesn’t need to see statistics—he’s lived these struggles. Hired initially by Bihar Development Trust (BDT), a local nonprofit organization promoting entrepreneurism and economic development, Shivanandan soon revealed he was far from ordinary. He quickly progressed, showing BDT how successful a weaver could become with a minimum investment in skills training and access to steady contracts. When BDT staff saw what progress this “prototype” go-getter Shivanandan could make when given just a small chance to advance, they launched Eco Kargha in October 2012. This new for-profit, Upaya-backed weaving company took on all of BDT’s weaving contracts and will continue to grow the business in Bhagalpur. Their social mission is to provide hundreds more jobs in Shivanandan’s area and meet the growing demand for woven silk and other fabrics in India’s big cities as well as export markets. Showing what’s possible when a man can access dignified, steady work, Shivanandan now carries the title of “Master Weaver” He spends three-quarters of his time on the loom, and the remainder overseeing others or working with Eco Kargha management to develop the business. He and his team – all Eco Kargha employees - make embroidered stoles and sarees of expensive silk for weddings and special occasions. Pedaling his bicycle into the office in Bhagalpur, ten kilometers away, Shivanandan checks in three times a week to try and procure more work. He and the twenty employees in the Eco Kargha pilot used to make $8 per saree; now they earn $28. He used to work about 90 days per year, but now works about 250 days per year. Shy and slow to open up at first, Shivanandan becomes animated and his hands rise and fall as he talks about his plans to buy a motorcycle to get around and sell more wares. He’s built four rooms in his house; it’s one of the largest homes in the village. He wants to paint it in bright colors, in cheerful contrast with the gray cinderblock and brittle thatch that dominate his village. As a Master Weaver, he is also involved with Eco Kargha’s sales and plans to build an open-air veranda where customers can visit comfortably to discuss orders for wedding sarees or tablecloths they’d like to order. Instead of eating just powdered Sattu, they now have a variety of rice, roti, vegetables, and even meat. Taking advantage of the skills training provided by his new employer, Shivanandan diversified his weaving designs and became secretary of his local weavers’ trust. And in a lottery-based award system through BDT, Shivanandan got to travel to India’s capital city, Delhi, to visit other artisans in the large Dilli Haat market. Following that trip Shivanandan - who used to speak only his local dialect of Angika - taught himself Hindi so he can converse with more customers in many places. Shivanandan still spends much of his time on the loom. He craves steady work all twelve months of the year. Advancing from 90 to 250 days of work per year is still not enough to keep his three looms humming or to feed his almost desperate ambition. Many of his neighbors complain there’s not enough work to keep food in their bellies. But Shivanandan pushes forward. We’ll let you know how far he expands his sales base once he buys that delivery motorcycle . . . and what color he decides to paint his house. Today, Kamla Devi stands proudly outside her new tea and snack stand. She excitedly shares her plans to send her children back to school, pay off her debts, and build a sturdy house. With the profits she’s earning from the tea stand plus the regular salary she receives as a Samridhi employee, her future is bright. Kamla’s future did not always look so promising. Last year, catastrophe struck her family when one of her five children, Kaushalya, was diagnosed with a life-threatening tumor. Kamla and her husband Kallu did not have the money to pay for her critical surgery. Kallu, who worked as a laborer, could only find work three to four months a year, and Kamla’s earnings from odd jobs like sweeping were sporadic and meager. To pay for their daughter’s steep medical bills, they drained their savings, borrowed 50,000 rupees (around $940 USD) from friends and family, and mortgaged their land. With only a buffalo and two calves in their possession, the family moved off their property. Two of Kamla’s children had to drop out of school to look for jobs to help support the family. In March of 2012, Samridhi offered Kamla and her family an opportunity to find financial stability. Since Kamla’s buffalo and calves were not producing milk, she was thrilled with the chance to rear and milk a cow and calf from Samridhi. That cow now produces two to three liters of milk daily, enough to provide her a reliable income. Kamla, a self-starter with an entrepreneurial spirit, was not satisfied to stop there. She soon channeled some of her earnings to open a nearby tea and snack shop, where she works after her Samridhi duties are done for the day. In the meantime, Samridhi also hired Kallu, who works at the nearby bulk milk chilling facility and helps to clean the equipment used to pour and test the milk. In their spare time, the couple’s older children assist with the facility’s bookkeeping and cook meals for both the family and Samridhi staff. With these additional jobs, the household is earning a little over 10,000 rupees (around $190) each month, and is using most of this to pay down its debts. Kamla hopes to soon repurchase their land, send their children to school, and build a home. With her drive and determination, she’ll reach her goals in no time! Sanjeev Kumar Das strikes one as a contented man; he makes no complaints about or apologies for the poverty of his condition. In his late thirties, Sanjeev carries a lot of obligation on his slight shoulders: He supports his wife Rekha, his father, and his two sons, ages 12 and 16. Used to be, he could get only six months of weaving work each year, and regularly had to pull his sons out of school so they could work as laborers for neighboring weavers. Together, the three can bring in around $550 per year to support the family of five. For this reason, they subsist on mostly government-provided rice, cooking twice per day and sharing any leftovers from dinner for breakfast. Prior to launch, Eco Kargha’s research chronicled the very poor conditions in the neighborhoods where Sanjeev and other artisans lived. “Drains were overflowing, houses were in dilapidated conditions, and nobody earned enough to provide meals for family on a year-round basis,” reports Eco Khargha founder Ravi Chandra. “We were moved by the conditions of the artisans,” he says. Eco Kargha’s mission is to provide skills training, employment, and prosperity to these weavers and their families. Now that Eco Kargha has employed Sanjeev, he’s receiving year-round work with projects and payments brought right to his door. His wife can often be found twisting thread and spinning bobbins to make even-textured thread with which to weave. When the materials are ready, Sanjeev runs the loom to weave the threads together. Before Eco Kharga created a direct connection from artisans to commercial markets, Bihar weavers took a lot of flack. More affluent buyers shuddered at the bad omens lurking in the silk twisted by dirty low-caste hands; they feared the silk would create skin infections. Weavers had to go out on their own and forge relationships with middlemen to sell their textiles. None knew if they would receive payment in a week, a month, or many months later. When they did manage to sell a piece or two, there was no “cash on carry”—only a smirking promise of future payment for the goods already in customers’ possessions. Ravi tells the story of one weaver forced to run around town in search of the thieving middleman, eventually finding the man at his uncle’s house to avoid paying the artisan for his work. On the other hand, Eco Kargha staff are known to show up on time with payments ready. If they say they’ll be there on Friday, they’ll be there on Friday. They roll in on scooters and bicycles, accept neatly folded stacks of scarves and sarees from the weavers, and promptly hand over the cash payments for the goods. Eco Kargha’s mission is to get more of the profits directly into weavers’ hands. Their clients feel grateful for steady work that’s simple and reliable. When the Upaya team visits Sanjeev on a cold winter morning, he smiles as he brushes his thick bangs away from his eyes. All the while he talks with us, his fingers fly across the rickety loom he inherited from his great-grandfather, from which he coaxes the most elegant silk stoles and sarees. Now that he has good steady work, he will socialize with us only over the top of the clacking loom. “It’s great if we can make weaving our main livelihood. We need something more dependable for our income,” he says emphatically. Sanjeev exudes enthusiasm, and you get the feeling he just approaches all his life in the same way. “I am very happy with this association,” Sanjeev tells us. “Kargha has immediate payment, and their system is transparent." The most difficult time in his life has now ended, according to Sanjeev. A shadow falls over his face when he recalls the 1989 Bhagalpur riots. “The community was united before this time, and I didn't expect that things would become so hostile. Everyone was frightened.” He won't talk about what happened, but it is obvious the memory still changes his demeanor completely when he thinks about it. “It took five years for things to become normal,” he says sadly. Feeding his family the same two meals a day - and pulling his kids out of school to help do it, has been hard on Sanjeev. Now he hopes quickly to earn enough to send his sons back to school. We hear that Sanjeev always completes his work on time, is well liked in the weaving community, and is on-track to be promoted this summer. If he can get more and more work from Eco Kargha, he’ll invest in a motorbike, television, and refrigerator – all aspirational purchases for this naturally optimistic man. Bindu Das does not know his exact age, but he says he’s “somewhere in my 60s” and plenty old enough to “worry about my granddaughter having to grow up here like this.” When we first stop by the semi-pucca (semi-permanent, made of brick, cloth, and thatch) house where Bindu lives with his wife, two sons and daughters-in-law, and two grandchildren—Bindu refuses to look up from his loom to speak with us. “So sorry, we can come back later,” offers Sachi Shenoy, Executive Director. He grunts as he sends the shuttle back and forth through his loom as fast as he can. “I’m just busy filling an order,” he mutters. “But I have opinions.” So he begins to talk, and the more time we spend with Bindu, the more we see that this stoic man, highly respected in his neighborhood, has a strong commitment to his community. “Many government officials have come by,” says Bindu, “they ask about the conditions, but then they never do anything about it. All his life, Bindu says, their village has needed its own school and healthcare center. The family eats only twice a day, with leftovers from last night’s dinner for comprising breakfast the next morning. Whenever possible, they enjoy the roti breads, leafy vegetables, potatoes, and rice that Bindu prefers. He and his sons have worked hard all their lives: Bindu as a weaver, his elder son as a shopkeeper in Bhagalpur, and his younger son as a day laborer. They make only $100 per month combined, but Bindu’s very proud to say that it is enough to send his 13-year-old grandson and 8-year-old granddaughter to government schools. Beside community toilets, Bindu hopes for a good school, a hospital and health clinic in the Champanagar village. For his own family he wants to work more and remodel his home into a solid pucca house, eat more variety of vegetables and legumes, and purchase a cycle. Bindu’s always had mixed feelings about his weaving: He’s proud of his skills, but for many years he could not depend on it for his livelihood. Eco Kargha now pays Bindu $77/month steady salary, an improvement over the unpredictable $65 he used to make combining weaving with other odd jobs. “You see,” Bindu says as he pushes back from his loom and lets little Neha climb onto his lap, “Greater income can buy us dignity. It means officials may take seriously our requests for schools to be built here, for better healthcare, and access to [clean] water.” As of now, he feels that he and his neighbors don’t have any voice at all. Mirze Town, Assam, India: 20-year-old Rekha was pulled out of school at age 12 to help her father with his chair-caning business. She worked for the family for six years until she was given into an arranged marriage at 18. "I loved school," she recalls. "My favorite subjects were advanced Assamese [the local language] and Hindi." She knows a bit of English and loves to read--especially mysteries--but now, "We don't have any books at home," she sighs. Rekha's given up on reading and any notion of going back to school. Right now, she faces intense pressure from her husband and in-laws to produce a baby. Two years into her marriage, she feels that she's failed them. Coming to work at a small paper-production factory gives her eight hours' reprieve. Rekha runs the machines and slices banana-tree fiber at Elrhino factory, a small enterprise run by Mahesh and Nisha Bora, a father and daughter with a social mission to lift locals out of poverty producing eco-friendly stationery and household goods. Fifteen employees work the machines in choreography, sterilizing the inputs, pressing pulp into large sheets of paper, and etching tea leaves into designs. Rekha spends the afternoon sitting in the shade just outside the side door of the warehouse, deftly peeling strips from a banana-tree trunk that will give fiber to Elrhino's concoction of rhino and elephant dung, recycled paper, cotton fabric scraps, and dried water-hyacinth stalks. Later, she sits cross-legged on the clean mud-plaster floor, in a circle with two other young women: The first girl counts twenty cut pages for each journal, then passes the pile to Rekha, who stitch-binds it along the left side; then the third girl adds a cardboard cover and glues on a colored-paper finish. Rekha (right) poses in the Elrhino factory doorway while founder Mahesh Bora looks on. "I learned [this work] by watching," she says. "The calendaring machine is my favorite." Rekha worked at Elrhino for several months before dropping out due to pregnancy; three months later she returned, somber, having miscarried. "It was very hard," she shakes her head, earrings dangling. Her thick, long hair is pulled back. She wraps her mustard-colored scarf a little tighter around her magenta salwar kameez. At first she says she wants a baby. Then she hesitates. "It will be nice if I have children, but if I have them too early I wouldn't be able to work. It's really my husband and in-laws who are the ones who want me to have a child." Making 3,500 rupees a month ($58), Rekha also feels she's learning a lot about paper production and design. "I would like to run the calendering machine and learn to operate the beater machine. Also, to learn to design like our master craftsman." She says what she's learning on the job gets her thinking about how to design better cane-weaving products for her father's business, too. Yet Rekha does not see one rupee of her earnings. Like many women in northeast India, Rekha hands over her salary to her husband, who spends it paying down the credit they rack up at the corner food shop and their rented house. "I wish I could set aside a bit for savings," Rekha says, "in case I become ill or if I encounter difficult times. I want to be prepared." She feels lucky. It's rare for women in this local culture even to be able to work outside the home after marriage. Many women run home-based livelihoods such as weaving and livestock care. Rekha's husband works just around the corner in a cotton-production factory, where "he does the same exact thing every day." “Elrhino is much better," she notes, "because there is a lot of scope to learn. If I learn skills here, then I can use those skills at home." Her husband wants to come work with her at Elrhino to keep an eye on her and ensure she does not even look at another man. Rekha struggles with herself about this, because she wants him to be happy. "We used to be happy. Now, if we don't have enough money we fight. So if I work here, at least there is peace in the house." She wishes things could be different. "If I could have my way, we would have a lot more progress in my family. For example, I'd like to have a small shop that I run myself, and then I would be happy. But, I don't have the money to invest in that." If only they had more money, "We would have no problems at home. Maybe we could even build a little house." So each morning, Rekha comes to work, and in the evenings, she watches soap operas on TV. "My favorite actor is a Hindi girl," she beams. "She is a very good dancer." Turns out, Rekha does a little singing and dancing too, in the traditional Assamese style that's quite popular here. "I love to sing," she confesses. When I'm working, I love to sing. I don't sing at home." Rekha gazes across the road to a cement factory on the other side of the road. Her chin tilts up slightly. "I love working here, but what I'd really like is to be in Guwahati [the nearest big city] and be a movie star." Now that she has let herself talk, out of earshot of the other employees, Rekha lights up, her thin arms waving to the image in her mind of that glamorous life. Here at the factory, she feels like she can be herself, laughing and singing with the other girls, creating elegant products that she's proud to know are selling in stores in faraway places like Guwahati, Delhi, and Paris. But much of the time, Rekha is somewhere else beside here, dreaming of a life she's only glimpsed onscreen. "I want to be someone big, to be in a movie, to dance. It would be so nice. They look so happy in the movies. I want to be like that." The Upaya team received the following update on Rekha from Elrhino CEO Nisha Bora after this story first posted. "Rekha is pregnant again and believes that now, perhaps, her in-laws and husband will embrace her. She wants a daughter but the rest of the family wants a son. She has chosen to opt out of work temporarily because she is afraid that coming to work might jeopardise the baby's life. Rekha has moved into the factory premises with her husband, into the single worker's cottage that we have at the moment. Her husband has replaced her on the factory floor. Rekha is bored and overcome with anxiety as she sits around waiting for her womb to do its job. She hobnobs with her ex-colleagues over lunch and tea breaks. I have encouraged her to keep busy by taking whatever crafts work she can or wants to, at the pace she is most comfortable with, and can do out of her cottage instead of having to be at the factory. She is craving some productive work, so she's expressed delight at the offer." When Husna joined Samridhi’s first group of goat farmers, she had 40 years’ experience in the business, but it hadn’t paid off for her. She’d cared for goats since childhood on a sharing basis (common in rural India) through which she would shelter and feed a goat belonging to someone else, and then split the milk output 50/50. However, “as the goats grew more sturdy and could survive, the owners would often come and take the goats back,” Husna recalls. Supplementing goat farming with potato harvesting, she made about 80 cents per day. Husna lived in what’s called a “kaccha” or “makeshift” house made of mud and thatch, with two raised beds and no other assets. At age 50, widowed in her thirties, she had singlehandedly raised four children: a son now working in Kolkata, one daughter married, and another son (15) and daughter (14). When the Samridhi opportunity arose in October, Husna signed on for three goats, increasing her earning potential to $2-3 a day. And the next time we visit Husna in late January, we cannot believe our eyes. Standing close to the exact spot where the mud hut had been is a charming brick house with an iron door and a curtained front window. The 10’ x 15’, one-room house has a built-in raised bed with storage below. It has floor-to-ceiling shelves stocked with dried foods, elegant ceramics and silver, storage containers and cooking utensils, and a cook stove. The mortar still smells fresh. Around Husna’s neck is a burgundy ribbon pendant, on which she has strung the silver key to her front door. Out back stands a sheltered pen for the goats, stacked with fresh hay and feed. “I built this house just next to the goats to motivate them on financial prosperity,” Husna jokes, posing with her goats for a photograph. Turns out, Husna has long been salting away savings in an account at her local post office. “I’ve been saving for 13 years for this house,” she says, “ever since my husband’s death. At first I was saving for my daughter’s wedding, but then I realized that the house is a priority. My son and son-in-law advised me to build a house, so that if anyone comes to marry my [youngest] daughter they will see that she is well off.” Husna’s eyes twinkle as she gazes across the interior of her well-stocked new home. Not only has she built a lovely, sturdy abode for herself, she’s upped her daughter’s chances of marrying into the type of financial security she’s built here. Husna constructed her house in three months with financial assistance from no one, not even her grown children. It cost $800. Part of her old mud and thatch house now serves as the shed for the goats. Now she’s off and running toward her next big goal, saving for the wedding, which will cost at least $1,000. Given her increase in income, Husna expects to be able to save that amount in two years. However, right now, Husna has some haggling to do with the company CEO over how things are run here in Berhara Village. Samridhi had tried out some fancy goats from Rajasthan that produce milk with higher fat density, and Husna believes that was a mistake. Her “foreign” goat fell ill and died, and she says she prefers the hardier local breed. “I will only be happy if you replace both [the one that died and the other Rajasthani] goats with local goats,” she says, tossing her headscarf. She banters good-naturedly with Samridhi CEO Lokesh Singh and staff veterinarian D.K., calling them names and bargaining until they come to an agreement to replace the two goats, allow Husna to choose them from The Goat Trust, and transport her on D.K.’s motorcycle so she will not have to be away all day. The plan is set for tomorrow, and Husna is satisfied. After all these years of working for other farmers, Husna struggles to believe that Samridhi actually has entrusted her with ownership of three goats. “I will believe these goats are mine once they [all] start giving milk,” she maintains. As she advocates for her goat-flock and envisions future earnings, Husna is wordlessly surrounded by a gaggle of grandchildren with big eyes who have come in to watch their grandma in action. Husna pauses to give hugs all around, at the same time pointing out that although she has family here in Berhara, they are all quite independent . . . and so is she. Yeah, we noticed. 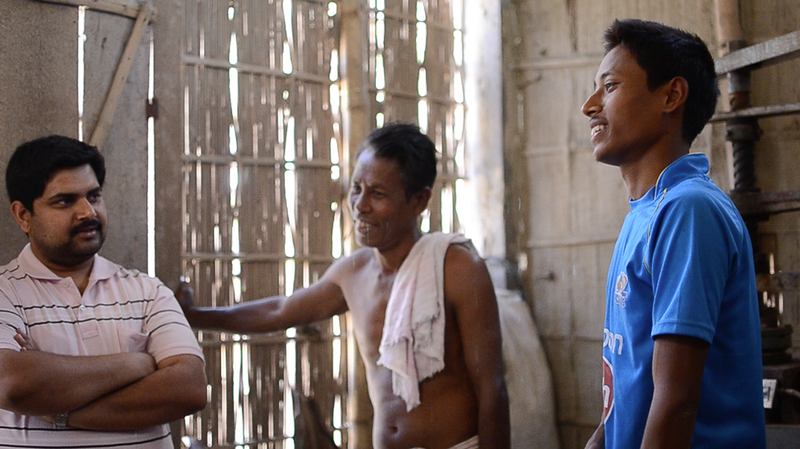 The Upaya team visited Dwijen Das and his family in Patla Village, Assam in the spring of 2014. Dwijen is an affiliate producer with Tamul Leaf Plates, and earns a living making disposable, biodegradable plates and bowls from fallen Arecanut (palm) leaves collected in his village. The Upaya team chatted with Dwijen as he and his son, Jituparna, delicately maneuvered leaves into the Tamul machines and stacked pressed plates against one wall. The Upaya team enjoyed a conversation with Dwijen Das, an affiliate producer with Tamul Leaf Plates, who earns a living pressing fallen Arecanut (palm) leaves into disposable, biodegradable plates and bowls sold throughout India. Q: How did you get started making Tambul Leaf Plates? Q: How has working with Tamul Plates helped you most? (left to right) Juli, Kanchan, Dwijen, and Jituparna in front of the family's production unit. Q: How else have you spent the extra money earned making plates? Jituparna (right) discusses his plans for expanding the production unit and employing others in Patla as his father (center) and Tamul Plates CEO Arindam Dasgupta (left) listen. Q: What does this work mean to you?